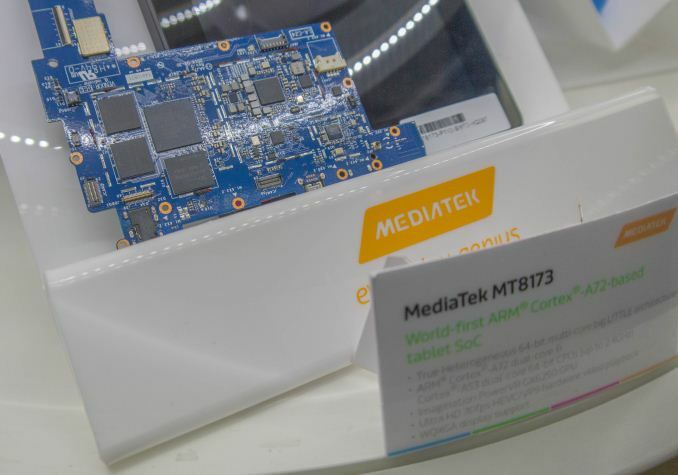 As part of our MWC coverage we had the pleasure to have a guided tour through MediaTek's booth to see what kind of new technologies the company has in its pipeline. MediaTek has seen some enormous momentum over the last few years and we're quickly seeing the Taiwanese company becoming a serious competitor to be reckoned with. What was far the biggest surprise for us was the showing off of MT8173 hardware, a mid-range tablet SoC employing ARM's new Cortex A72. It's only been a few weeks since ARM officially announced the ARM Cortex A72, and while we still don't know much about the micro-architectural nuances of the core, having MediaTek already displaying silicon is a severe departure from ARM's usual announcement-to-release cadence. This puts the number A72 licensees with announced products already at two, with Qualcomm being the other one in the form of the Snapdragon 618 and 620. The MT8173 employs two Cortex A72 CPUs at up to 2.4GHz and two Cortex A53 CPUs in a big.LITTLE configuration. On the GPU side we find a PowerVR GX6250 GPU, which if MediaTek's clocking strategy continues should run north of 700MHz. The SoC is still powered by LPDDR3 as the preferred memory interface, undoubtedly a cost decision as we're only starting to see LPDDR4 in flagship devices. On the multimedia side there's MediaTek's new display pipeline capable of 120Hz operation, 4K H.264/HEVC(10-bit)/VP9 video decoders and an ISP capable of 20MP sensors. As part of the MWC announcements was also a (re)branding of MediaTek's SoC lineup. Beginning with the MT6795 which is now denominated the Helio X10, MediaTek will in the future begin naming their new chips after the Helio (After the Greek word for sun, "helios") brand. We'll be seeing the P-line targeting the premium performance segment while the X-line targets the high-end and the best MediaTek has to offer. As part of the booth demos, MediaTek showed off the MT3188 wireless charging IC solution which supports all three currently available standards, PMA, WPC and the newly emerged A4WP standard. 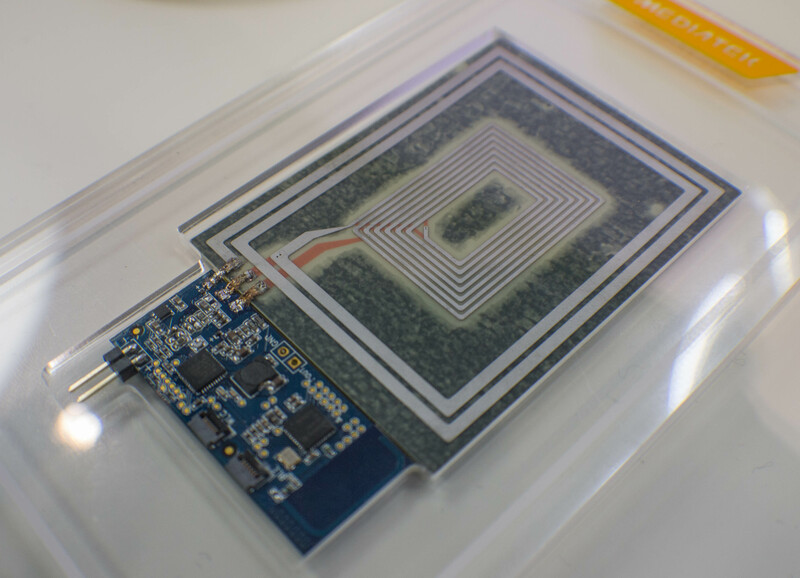 While we've had the IC announced early last year, it is still impressive to see the real thing in hardware. WPC (Wireless Power Consortium) is by far the currently most widely available standard in the form of Qi, which has seen large adoption in the mobile space. PMA (Power Matters Alliance) remains as the competitor standard but which hasn't seen as wide of an adoption rate with its Powermat/Duracell chargers. Both WPC and PMA rely on inductive charging which limit the spatial freedom between the transmitter and receiver coils to a few mm. A4WP on the other hand is the new standard which is based on resonance charging, giving devices the freedom in x, y and z directions around the emitter coil. The charging area can be much larger than in the inductive charging technologies and also allows for one charger to simultaneously charge multiple devices. The advantage of inductive charging over resonance charging remains in the efficiency and EMI aspects. The demonstration of the A4WP standard was impressive as it allows for an enormous amount of flexibility in terms of integrating charging pads into furniture. Among multi-device charging bases, we also saw charging through relatively thick wooden tables where the charger was hidden underneath, instead of having to integrate them into the table of having a mat on lying on top. The MT3188 joins other unified charging solutions such as Broadcomm's BCM59350 which we also saw demonsrated at MWC this year. Another interesting demo was the showing off of MiraVision integrated in MediaTek's SoCs. Basically MiraVision is a fixed-function post-processor which sits on the display pipeline which has full control of the image data being sent to the display. The use-cases which MediaTek demonstrated were colour gamut manipulation on one side, something which is already for example done in products such as the Meizu MX4 with the MT6595. What was impressive to me was the dynamic analysis of image content in dark environments and subsequent adjusting of back-light and pixel data to allow for better visibility. Think of it as a dynamic gamma-curve adjustment. There were a few demos, including a third-person shooter one where the effect was considerable to the viewing experience. We've seen Samsung employ similar technology in their Exynos and television SoCs called mDNIe (Mobile digital natural image enhancement) which used among other things to change between display profiles on Galaxy devices. MediaTek's solution seems to one-up that as it allows for more dynamic settings as opposed to simply just having fixed programmed profiles. MediaTek also demonstrated a frame-interpolation function for video playback through MiraVision. The result is similar to what SVP achieves in the PC space via software, but here it's again implemented through fixed-function hardware to achieve high performance at very low power. Video content that is sourced at 24fps is interpolated to 60fps on the screen. The result is remarkable on a small screen as it suffers less from the "fake motion" that one associates with such techniques (Or MediaTek's implementation is just really good?). The demo unit was again a Meizu MX4, so it means the hardware and products are already out there but just merely need to be officially adopted by the vendors in software. Modems are an important part of MediaTek's strategy and we've had more or less a status-update on how things are progressing. 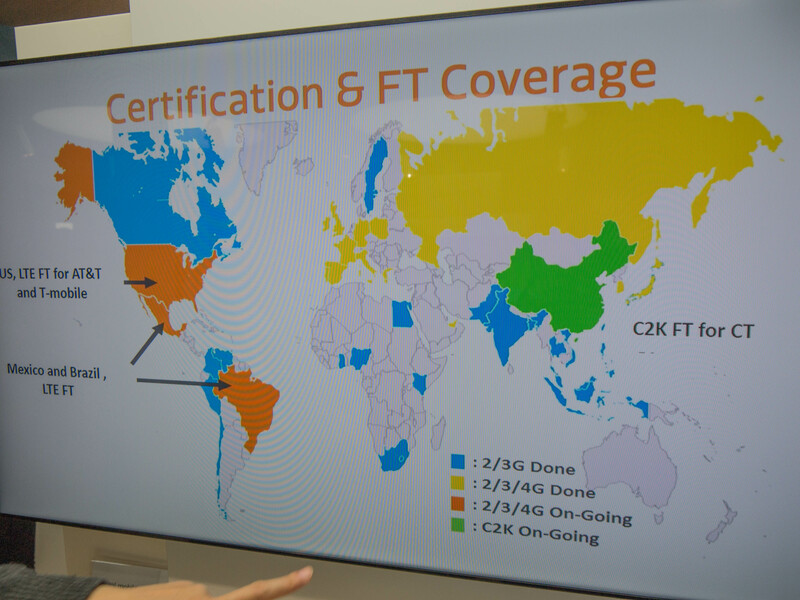 The LTE products from MediaTek are still far and few in-between that seems to be changing in the future as we're seeing quick progression from the current Cat. 4 modem IP to Cat. 6 solutions in 2015 and Cat. 10 in 2016. An interesting addition is the adoption and field testing of C2K, or better known as CDMA2000. Other vendors such as Intel and Samsung chose not to adopt the technology as in the future we'll see it being phased out in favour of LTE-only networks. For MediaTek to adopt it even though long-term it makes no sense, puts them in a unique position against Qualcomm in markets such as the US and China. Did MTK even announced anything beyond 20nm? The TSMC 20nm planar process seems quite bad, seeing how underperforming the Snapdragon 810 turned out. Problem may not be the process but the design. 810 was a rushed SoC as Qualcomm found itself quite behind the competitors with no 64 bit architecture while professing that 64bit was useless at this point of mobile market evolution. We can see Qualcomm wrong strategy in the fact that they will have their own 64bit custom architecture quite late this year (or early next one) and had to use ARM standard IP for their top tier SoC. I think that the TSMC process is obviously the main issue here. That's a valid point, although very relative. The A8 throttles also, but doesn't have any competition within its ecosystem.